"Marty Whitman has distilled decades of distressed investing experience into a text that is a must-read for everyone interested in the field, whether a student or a professional investor." 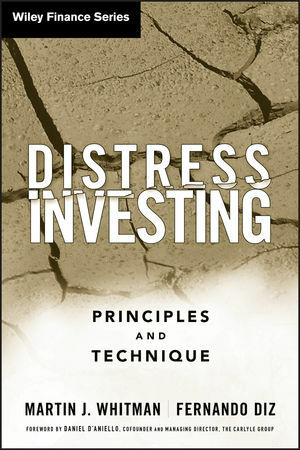 "Distress Investing: Principles and Technique represents a detailed and unique perspective on an arcane arena of investment that is going to get a lot more attention. Marty Whitman is the master, and has set the standard for many years." "Martin Whitman and Professor Diz have produced a seminal work on the ins and outs of distressed investing for all distressed debt investors. It is jam-packed with information and guidance for the novice and the experienced. A must-read for anyone interested in distressed investing." "Marty Whitman, a legend in distress investing, packs decades of experience into these pages. The restructuring of the capital markets currently under way is sure to provide great distress investment opportunities, which this guide book can make count for you." BRUCE FLATT, Brookfield Asset Management Inc.
"The principles found in this book are those I used in the reorganization of my business from bankruptcy to an S&P 500 company with an investment grade rating and a multibillion-dollar market capitalization. An excellent premier by Marty Whitman and Professor Diz, integrating economic theory with real-world investment to help investors of all shapes and sizes understand and invest in distressed securities." GENE ISENBERG, Chairman and CEO, Nabors Industries, Inc.
"Marty Whitman, the unquestioned 'Dean' of active distressed investors, and Fernando Diz, one of the few academics specializing in distressed investing, have teamed up to provide perhaps the best and most comprehensive primer on distressed securities and markets. I learned so much from this remarkable volume." MARTIN J. WHITMAN is Chairman and co-CIO of Third Avenue Management LLC. He has taught courses in value investing and distressed investing for the past thirty years at the Schools of Management at both Syracuse University and Yale University. Whitman is also the author of the Wiley titles Value Investing and The Aggressive Conservative Investor. C is the Martin J. Whitman Associate Professor of Finance and Director of the Ballentine Investment Institute at Syracuse University. His research specialties are in the areas of trading, derivative securities, and value and distress investing. Diz has written for the Journal of Futures Markets, the Review of Financial Studies, and the Journal of Alternative Investments.